Hafez Modirzadeh's new jazz album is unlike anything you have heard before. And that's exactly the point. SF State Professor of Music Hafez Modirzadeh. Credit: Andrew Nozaka. Twenty years ago, the professor of music introduced the concept of "chromodality," a cross-cultural dialogue of musical styles from around the world. In "Post-Chromodal Out!," he aims to take that concept a step further by intertwining Western and Eastern tuning systems so tightly they cease to be categorized by their original cultural heritages and instead become something different by traditional standards. "Chromodality came out of trying to create a language that would share musical structures from all over the world," Modirzadeh said. "Now it's really beyond that. Now all of that has just sort of disintegrated together into purely human expression." The son of an American mother and Iranian father, Modirzadeh began with jazz and Persian musical traditions to create a sound rooted in both, but unique in its execution. To a first-time listener, the songs may sound out of tune since the two styles utilize different sets of musical notes. "My background in jazz happens to be from my American upbringing," Modirzadeh said. "But because of my father's heritage I looked into Persian music, which opened up a whole new world to me." Western music is typically based on the 88 "half-tones" represented by the keys of a piano and shared by other instruments, from the guitar and violin to the trumpet and clarinet. Persian music, however, uses a different set of scales that incorporates "quarter-tones," notes literally between those heard in Western music. To create these notes on Western jazz instruments, Modirzadeh and his fellow musicians had to get creative. 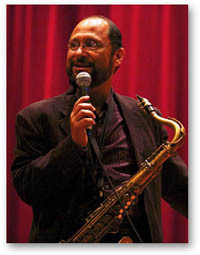 On "Post-Chromodal Out!," Modirzadeh used alternate fingerings on his saxophone to adjust pitches slightly upward or downward, while trumpet player Amir Elsaffar did the same on his instrument by adjusting his blowing technique as well as tuning slides. Meanwhile, a guitar and piano were retuned to incorporate quarter-tones. "Post-Chromodal Out!" is Modirzadeh's ninth solo album, and he will perform at an event with pianist Vijay Iver and the Kuumbwa Jazz Center in Santa Cruz on Oct. 10. A tenth solo album has been recorded but not yet released, and he has appeared as a supporting player on more than 30 other albums. At SF State, he advises the Music and Dance department's World Music program. "Post-Chromodal Out!" has been well reviewed by The New York Times and others, and Modirzadeh hopes listeners tune in and allow its unconventional sound to expand their musical boundaries. "I hope it opens up listeners' imaginations and inspires them to continue seeking different possibilities to explore outside the norm," he said. Click here for a sample of Modirzadeh's work and to hear him talk about his music.